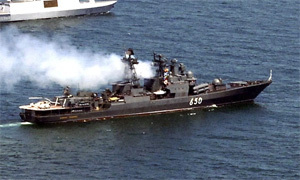 The Russian Navy is going to return to its bases abroad. A statement to this effect was made by the spokesman for the Navy's headquarters last week. What will the Russian Navy's return be like after 20 years' absence? What goals can it pursue? During the Cold War, the Soviet Navy was stationed in the Mediterranean to prevent an attack by Western aircraft carriers and submarines. At present, the tensions in the region have subsided because of severe cuts in the American naval forces. Yet, the region retains its importance as a key crossroads between Europe, Asia and Africa. Russian ships started to make frequent appearances in the Red Sea and the Indian Ocean after the opening of the Suez Canal. The new route was actively used for travelling to the Far East. Before the opening of the Trans-Siberian Railway and the North Sea Route, this was the only way of establishing a fast and regular connection with the remotest Russian regions. However, even after these alternatives appeared, the Russian Navy strategists continued to be interested in the Red Sea route, as it is one of the busiest sea routes accounting for almost 10% of the world's cargo turnover. The Socotra Archipelago is located off the Horn of Africa, 350 km to the south of the Arabian Peninsula. Its location makes it possible to control the navigation in the Gulf of Aden, towards the west, along the African coast to the south and along the Arabian Peninsular to the north-east. The Soviet Union established a base on Socotra in 1971, and actively used it for a variety of purposes, including fighting piracy, until the break-up of the U.S.S.R in 1991. This base is expected to play a special role in fighting piracy, because Russia will be able to use small vessels, trawlers and other boats of minor rank, without resorting to big ships that are not designed for this purpose. Major ships will have a reliable logistics system, which will allow them to perform operations in the Indian Ocean. It will be possible to change crews, make minor repairs, and replenish reserves without using auxiliary ships or returning home, sometimes, a thousand miles away. At the same time, such prospects require an adequate mechanism. Any base is worth something when it can be defended, and for the time being the Russian Navy does not have enough ships to protect a regular sizeable presence in the remote seas. Should the Navy's ambitious plans be perceived as evidence that it is going to get new combat ships, as well as carrier-planes and helicopters, armament and coastal guard equipment in sufficient quantities? If this is true, the implementation of the plans to revive foreign military bases will be one of the most successful projects of Russian foreign policy this century.